In honor of the launch of the Lindenbaum Center for the Study of Modern Orthodox Halakha’s new website. 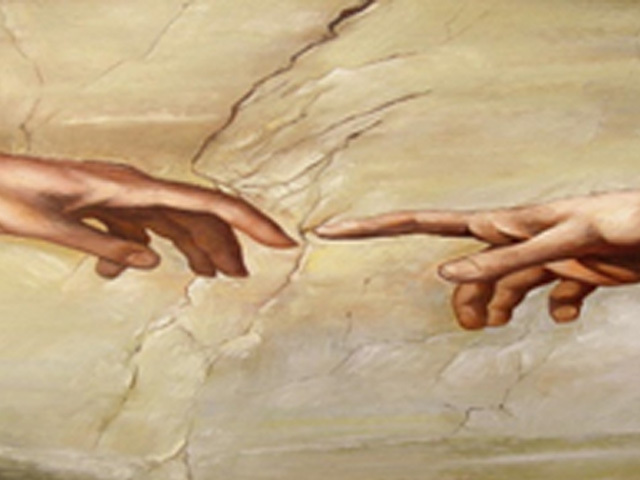 When thinking about the ethos of halakha, I am always reminded of Michelangelo’s Creation painting. Michelangelo’s Creation is an artistic masterpiece that also packs a powerful theological punch. The Italian master is obviously celebrating the religious enormity of creation, but is at the same time also bemoaning its theological tragedy. It is hard to ignore the sad aura that permeates the entire scene. The background is dark, perhaps cloudy, and the characters’ facial expressions seem to convey doubt, fear, and hesitation. Adam in particular seems overwhelmed by the experience; he looks sad, lonely, and forlorn. All the pathos Michelangelo is depicting seems to coalesce in the evocative focal point at its center: the empty space between Adam’s and God’s outstretched fingers. God and Adam are seemingly reaching out to each other, desperately trying to touch and connect, but they cannot; an unbridgeable gulf, Michelangelo seems to imply, separates them from one another. Michelangelo’s message essentially seems to be one of defeat and despair. He ultimately believed that God and humanity are destined to hover perpetually in an estranged state, separate and distant from one another, their craving for intimacy never fully satisfied. He was wrong, though. Humankind did develop a medium that allows it to surmount what Michelangelo assumed to be an unbridgeable gulf: the creation of halakha! The gap he so aptly illustrated dissipates in the halakhic arena. God and humanity are in each other’s grip in that space, not at all distant from one another. That is where we hold on tightly to one another, swirling in a loving embrace of mutual dependence, because halakhic jurisprudence is a dialogical and interactive process whose success is predicated on an assumption of (metaphorical) intellectual intimacy and destinational mutuality between God and us. God provides halakha’s mandate; humankind chaperones its application. Law without a divine mandate lacks transcendental significance, while halakha without human input is destined to wither and disappear. As a matter of fact, the Psalmist says as much in his brief thesis on the theological foundation of halakhic jurisprudence. “God stands in the midst of the judiciary, He adjudicates alongside the judges,” he proclaims in Psalm 82:1, placing the divine at the center of judicial adjudication. One cannot help but hear in these words a Psalmist (albeit anachronistic) rejection of Michelangelo’s depiction of humankind’s tragic state of perpetual spiritual loneliness. He is refuting the Italian master’s pessimistic outlook by describing halakhic production as a place where God and humanity are linked and intertwined with one another. Humanity is not spiritually doomed, he says. The Sages spoke about religious law in a similar vein. When they famously proclaimed (Bava Metzia 59B) that “Torah is not in heaven,” they were, counter to conventional interpretation, integrating God into the judicial process, not excluding Him. They did not write God out of the proceedings but instead activated their part in the mutually agreed-upon judicial partnership. They were actually saying: “Torah is not [ONLY] in heaven;” its success is also dependent on the judicial creativity of humankind. Applied Torah hovers in that blank space Michelangelo portrayed, where the Lawgiver and lawmakers reach out to each other. But, counter to his portrayal, in the halakhic arena these two actors in the divine drama of creation and creativity actually touch – metaphorically. God and humanity dialogue and intersect in a mode of interdependence. When the Sages made their emphatic proclamation (“Torah is not in heaven”) they were, therefore, being celebratory, not triumphant. They were celebrating a mutually fulfilling partnership between God and us that is multifaceted, one that satisfies our spiritual aspirations and at the same time also enhances our social interactions. Halakhic engagement is spiritually fulfilling, intellectually rewarding, and communally beneficial. In addition to providing an opportunity for theological companionship between humankind and its Creator, integrated halakha is theologically robust and societally conscious, creating a community that is intellectually engaged, sociologically fortified, and ideationally self-aware. Halakha is the exclusive classical arena in which the important issues of the day are debated and explored, the tool the right and the left historically have used and continue to use to articulate their visions for a vibrant and relevant Judaism. It is where intellectual Judaism mostly occurs. Halakha is therefore where one goes when in pursuit of optimal Jewish literacy; that is where all the essential debates happen. Halakha’s value, however, is not merely academic; it also has communal and sociological benefits. Legalese is indeed halakha’s hardware, but its ultimate purpose is to create a safe haven of structure in our otherwise chaotic lives. Halakhic adjudication therefore is really an attempt to solidify the fortress of stability halakha attempts to create. Ultimately, one studies halakha for the intellectual stimulation, practices it for its ability to provide structure, because halakha creates an infrastructure in which life can thrive and flourish, and shares or debates it with others for its potential to build relationships. Finally and most importantly, halakha is Judaism’s version of carbon dating; it is how we engrave our imprint on history’s timeline. A close reading of any halakhic text immediately reveals its historical provenance, because every generation’s halakhic voice is unique and distinctive, made up of its own particular version of the intersection between age-old halakha and time-specific reality. Halakhic decisiors throughout history used the same primary ingredients; the flavoring, however, has been unique and particular – like a chameleon, constantly changing colors, but nevertheless continuously, at its core, staying the same. That has been the case ever since Judaism became a halakhic community, but for today. Halakhic creativity has been the hallmark of every generation until ours. We are the exception. Modern Orthodoxy has been around for a while but has not yet managed to significantly latch onto the historic link of halakhic creativity. We do have great and towering poskim that we can claim as our own, but they are few and far apart. One would be hard-pressed to find more than a handful of responsa on the shelves of the beit midrash that were written by people who abide by a Modern Orthodox value system. While the voluminous responsa by luminaries such as Rav Moshe Feinstein and Rav Ovadya Yosef are no doubt helpful and illuminating, they are insufficient. Value compatibility is essential for judicial relevancy. If the judge does not share the values of those he or she judges, his or her adjudication lacks the judicial authority to be binding and authoritative. The gap in native Modern Orthodox jurisprudential creativity is a lacuna in our religious facade, one that renders our religious fabric incomplete. Our צו השעה (immediate moral imperative) is therefore to embark on the next stage of religious ascendency. We need to enter the arena of halakha and make it our own. Liberal, conservative, and centrist Orthodoxy need to take their arguments into the arena where important debates have traditionally been fought: in the battlefield of halakha. That will give our discussions the gravitas they currently are lacking. Traditional debates most often are not resolved by quoting a line from the Talmud or a sentence from Midrash; they are won by getting into the muck of the nitty-gritty of our rich and elaborate halakhic tradition. It is time we got our hands “dirty” and put some flesh on the skeletal discussions we are currently having. Otherwise history will remember us as the generation that broke the link of substantive halakhic discourse that started when Moshe Rabbeinu, in the desert, debated the merits of female inheritance with Tzlofchod’s heirs. 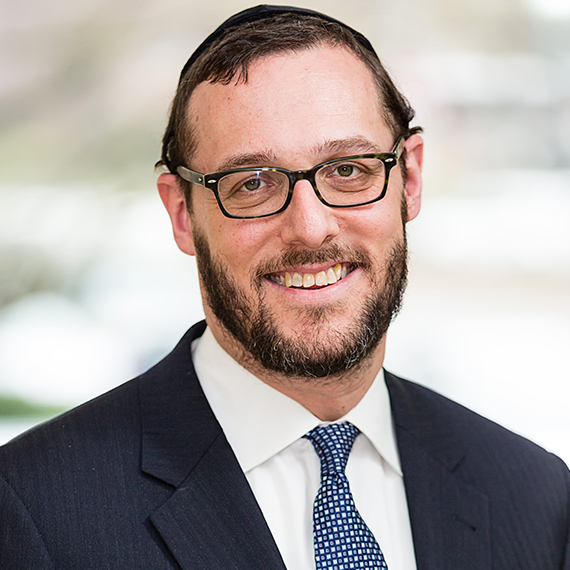 Embracing the next phase in our communal maturation, the creation of a halakhic discourse that is native to our Modern Orthodox values and beliefs, is obligatory, not optional. Our community desperately needs access to the level of religious engagement that halakhic discourse provides. It will make us communally stronger, solidify our connection to our judicial forbearers, and, most importantly, will create a community that is infused with a deep and intimate spirituality, one that is equipped to bridge the gap tragically depicted by Michelangelo’s Creation masterpiece.